Sounds to me like he took a fairly sensible approach to matters of faith, LL. ISTANBUL (AP) — Turkey's main opposition party says the government is blocking a full investigation into last summer's failed coup attempt. 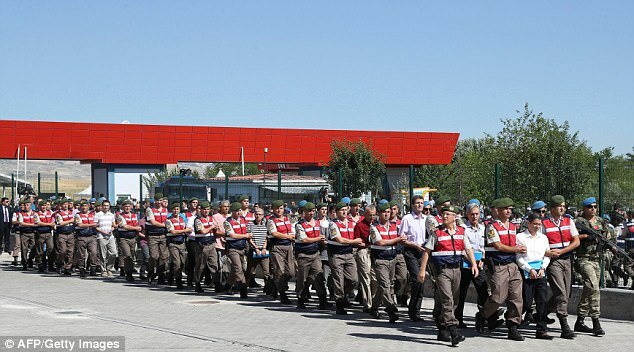 Bulent Tezcan, the spokesman of the Republican People's Party, said the government was using the commemorations for the anniversary of the failed July 15, 2016, coup to "write a fabricated history." Turkey blames U.S.-based cleric Fethullah Gulen for the botched coup attempt. He denies the allegations. Tezcan said inquiries into how Gulen's network allegedly rose within the state were obstructed to hide the "political side" of the coup and to protect the current government. Tezcan, speaking Sunday to The Associated Press, says "the facts need to come out for the sacred memory of the 250 martyrs" — those who died resisting the coup. I've been looking at some of the images from this weekend's 'commemoration', LL, and it struck me that Erdogan is terrifyingly good at manipulating both Turkish MSM and social media. It's stuff right out of the Hitler/Stalin How to be a dictator instruction manual. IMO, Turkey is on course for disaster, sooner or later. ISTANBUL (AP) — A court in Istanbul ordered six human rights activists — including Amnesty International's Turkey director — formally arrested Tuesday pending a trial over accusations that they aided an armed terror group, adding to concerns over human rights in the country. Four others activists were released from custody pending the outcome of a trial. They have been barred from traveling abroad and have to report regularly to police. The group was detained earlier this month in a police raid at a hotel on Buyukada island while attending a training workshop on digital security. It is not clear which terror organization they are accused of helping but Turkish media reports said prosecutors, requesting the arrests, presented as evidence records of their communications with suspects linked to Kurdish and left-wing militants as well as the movement led by U.S.-based Muslim preacher Fethullah Gulen, who is accused of orchestrating last year's failed coup attempt. Turkish President Recep Tayyip Erdogan had earlier this month made vague accusations, saying the group was involved in a meeting that had the "nature of a continuation" of the coup attempt. Those ordered jailed include Amnesty's Turkey director, Idil Eser, and activists from the Helsinki Citizens Assembly and the Human Rights' Agenda Association. Their two trainers — a German and a Swede — were also arrested. Amnesty, which had called for their release, said their case is a test for Turkey's judiciary. "Turkey will be disgraced in the eyes of world if these human rights defenders are put in prison for defending human rights," Andrew Gardner, Amnesty's Turkey researcher, told a group of reporters waiting outside the courthouse as the group was being questioned by prosecutors. Turkey declared a state of emergency days after the coup and launched a massive crackdown, arresting about 50,000 people and dismissing more than 100,000 workers from government jobs. The crackdown initially focused on people with suspected ties to the alleged coup plotters, but has been extended to include politicians, journalists and activists. “The U.S. takes force protection seriously, obviously,” Stein said by email on Wednesday. “The Turkish government knows this, and still decided to leak the locations of U.S. bases in Syria. Hard not to see this as a F-you.”....etc. I have NO sympathy whatsoever for the Pentagon. I wonder how the US would like it if China started building military bases in Texas? Turkey re-arrests activists in Amnesty case involving German, Swedish citizens. Turkish security forces have re-arrested two activists previously detained but then released in a controversial case that has raised tensions with the West, Amnesty International said on Saturday. The two were among 10 people detained earlier this month in a raid by police on a workshop session of human rights activists held on an island off Istanbul. A Turkish court on Tuesday ordered six of the human rights activists, including Amnesty International's Turkey director Idil Eser, to be remanded in custody on charges of aiding a "terror" group. But an Istanbul court on Friday issued new arrest warrants for the four -- Nalan Erkem, Seyhmus Ozbekli, Nejat Tastan and Ilknur Ustun -- after granting an appeal from prosecutors against their release. Amnesty said Erkem was detained from her house in Istanbul late Friday and Ustun was detained from her home in Ankara on Saturday. There was no immediate indication of the whereabouts of Ozbekli and Tastan. John Dalhuisen, Amnesty International's Director for Europe described the new detention orders as a "cruel and retrograde step" and said the Turkish authorities have "raised their absurdity to fresh heights". "Turkey has underlined its growing reputation as an indiscriminate jailer of civil society activists and a stranger to the rule of law," he said. The decision to remand the six in custody earlier this week sparked international alarm and amplified fears of declining freedom of expression under President Recep Tayyip Erdogan. Eight of the 10 initially detained are Turkish rights activists. But the other two are German Peter Steudtner and Swede Ali Gharavi, who were leading the digital information workshop. This has stoked tensions in particular with Berlin, which is now looking at an overhaul of its relations with Ankara. Sweden's foreign minister, Margot Wallström, also criticised Turkey for jailing Gharavi and the other human rights activists. Amnesty describes Gharavi as an IT strategy consultant and Steudtner as a "non-violence and well-being trainer". Last month Amnesty International's Turkey chair, Taner Kilic, was remanded in custody on what the group described as "baseless charges" of links to the alleged mastermind of the July 15 failed coup Fethullah Gülen. Oh, that'll really help matters, won't it? Powerless organisations insulting semi-dictators with huge popular support is sheer genius! Well done - you've given Erdogan the perfect excuse to lock up more Amnesty activists! Turkey backtracks on terror financing charge against German companies. Germany said the Turkey had informed it on Monday that it had dropped accusations of "terrorism" funding against major German companies amid a raging dispute between the NATO partners. As relations between Berlin and Ankara plumbed new depths, a spokesman for the German interior ministry said his Turkish counterpart had contacted him about the allegations levelled against nearly 700 German firms including giants Daimler and BASF. The spokesman, Tobias Plate, said Berlin had been told that the list of companies with Turkish operations being investigated for "financing of terrorism" lodged with Interpol in May had been withdrawn, saying the suspicion had been based on a "communication problem". The Turkish interior minister "assured us that the Turkish authorities were not investigating companies on the list in Turkey or in Germany," he said. German newspaper Die Zeit reported last week that Turkey had handed Germany a list of 68 companies and individuals suspected of links to terror due to alleged contacts with the group of the US-based preacher Fethullah Gulen, who is blamed for Turkey's failed coup last year. Gulen denies the charge. Die Zeit said the companies probed ranged from industrial behemoths to a stall selling doner kebab in the west of Germany. Turkish President Recep Tayyip Erdogan on Friday denied the claims, saying the reports were "black propaganda" aimed at pressurising German companies not to invest in Turkey. Turkish Prime Minister Binali Yildirim had also dismissed the report as "entirely a lie" and urged Berlin to solve an escalating crisis through dialogue. A spokeswoman for the German economy ministry, Tanja Alemany, said Monday that despite the "clarification" of the issue, it would "take a while before German companies can win back confidence" in Turkey as a place to do business. Ankara's overture to Berlin came amid severe tensions between the NATO allies over arrests of German citizens. German Foreign Minister Sigmar Gabriel had said on Thursday that Berlin would review state guarantees for foreign investment in Turkey and urge businesses against putting their money in the country. The German foreign ministry also warned it could no longer guarantee its citizens' safety in Turkey, in a move sure to impact Turkey's crucial tourism industry. But Berlin was already furious over the jailing in February of Deniz Yucel, Turkey correspondent for Die Welt newspaper, who Erdogan has personally denounced as a "terror agent". Ah, so $$$$$ keeps Erdogan in check? Interesting. EU-Turkey talks fail to ease friction over detentions. BRUSSELS (AP) — High-level talks that European Union officials had with Turkey's foreign minister Tuesday did not appear to ease tensions between the 28-nation bloc and Ankara over a wave of detentions of human rights defenders, journalists and others. After the meeting in Brussels, European enlargement commissioner Johannes Hahn expressed "very strong concern" about the detentions, while Turkish Foreign Minister Mevlut Cavusoglu defended them as a necessary part of his country's fight against extremism. Before the talks in Brussels started, Turkish President Recep Tayyip Erdogan signaled that the era of Turkey bowing to Western pressure was over. "The West wants Turkey to bring about their demands no questions asked... I am sorry to say that Turkey no longer exists," Erdogan told a meeting of his ruling party's legislators. The meeting in Brussels was formally about Turkey's long-stalled bid for EU membership, the fight against terrorism and energy and trade ties. But they were held in the shadow of the sweeping government crackdown that came in the aftermath of a failed coup last year. More than 50,000 people, including journalists and opposition lawmakers, have been detained since the July 15, 2016 coup attempt. Critics say the purge initially targeted people suspected of links to the leaders of the failed military takeover, but has expanded to include government opponents. "Human rights, the rule of law, democracy, fundamental freedoms — including media freedom — are all basic imperative requirements for any progress towards the European Union," Hahn said. The EU wants to see "progress in all these areas," he said. "I would like to stress once again our very strong concern about the imprisonment of a large number of journalists, writers, academics, lawyers and human rights defenders and we expect a due legal procedure in respect of the presumption of innocence," Hahn said. Cavusoglu, however, defended the arrests of activists and journalists by saying they were detained on suspicion of involvement with extremists. Turkey applied to join the EU three decades ago, and it started negotiating in 2005. But of the 16 negotiating chapters on issues as varied as capital movement and food safety, only one — science and research — has been provisionally closed. Ankara's minister in charge of EU issues, Omer Celik, said Tuesday's discussions were "constructive." "It's clear that we have differences, that we have disagreements, but dialogue, discussions and (the) search for settlements ... will of course continue," Celik added. Celik called accession negotiations "the backbone" of EU-Turkey relations and said the best way to discuss differences would be to open accession chapters. He said the chapters that cover the judiciary, fundamental rights and security should be opened. Before the meeting, human rights activists urged the EU to use the meeting to press Ankara to release detained rights activists. Amnesty International's Turkey director, Idil Eser, and its chair, Taner Kilic, are among those being detained. "Our call is very simple. We want the unconditional and immediate release of these human rights defenders," Amnesty International Secretary General Salil Shetty said. I am afraid that Amnesty have no big stick to wave, and their own reputation is none too good since they started meddling in politics. Demanding concessions from populist semi-dictators will get them nowhere, IMO. In 1998, Amnesty International adopted Erdogan as a prisoner of conscience and campaigned for his release. Now he jails its director and chair. "The minarets are our bayonets the domes our helmets the mosques our barracks and the faithful our soldiers." "One thing that I can not digest, if the skies and the ground were to open against us. If floods and volcanoes were to burst upon us, we are those who are proud with the Iman of our ancestors, they never kneeled down to frightening things any day, deeds of glory, deed of Anatolia, from Malazgirt til Canakkale, faith impenetrable to fortresses, our ancestors rushing from one victory to another, this is unity and togetherness." And that didn't give Amnesty a clue as to his true nature? No alarm bells rang? Turkish court frees 7 newspaper staff, keeps 5 in jail. ISTANBUL (AP) — A Turkish court on Friday ordered the release of seven journalists and staff members of an opposition newspaper pending the outcome of their trial but ruled that five others should remain jailed. The employees of Cumhuriyet, a newspaper staunchly opposed to President Recep Tayyip Erdogan, are accused of aiding terror organizations in a case that has added to concerns over rights, freedoms and judicial independence in Turkey. A total of 19 people are on trial, including Cumhuriyet's editor-in-chief Murat Sabuncu, investigative journalist Ahmet Sik, commentator Kadri Gursel and cartoonist Musa Kart. They're charged with "sponsoring" several outlawed organizations, including Kurdish militants, a far-left group and the network of U.S.-based cleric Fethullah Gulen, who is blamed for last year's failed coup. Two of the suspects, including Cumhuriyet's former chief editor Can Dundar, are being tried in absentia. Dundar is in Germany. Their arrests were part of a widespread government crackdown in the wake of the coup that has led to the imprisonment of more than 50,000 people, including journalists, opposition lawmakers and activists. Critics say the crackdown that initially targeted people suspected of links to the failed coup has expanded to include government opponents. Kart was among those who were ordered released pending trial. Sabuncu, Sik and Gursel will remain jailed. Five of the defendants had been released before the start of the trial. The trial was adjourned until Sept. 11. Some of the Cumhuriyet staff members have been in prison for nine months. They face sentences between 7½ and 43 years. All of the defendants denied the accusations during five days of hearings this week. Turkey's president declares dress code for suspects on trial. ISTANBUL (AP) — Turkey's president has announced clothing to be worn by defendants appearing in court for alleged involvement in last year's failed coup and terrorism. President Recep Tayyip Erdogan on Saturday said there would be two types of brown outfits for criminal suspects: jumpsuits for "coup plotters" and jackets and trousers for "terrorists." Speaking at a stadium opening in eastern Malatya province, he said: "No more coming to court wearing whatever they want." Erdogan first demanded court attire "like in Guantanamo" on the anniversary of the July 15 coup attempt. Days earlier, a former soldier appeared in court wearing a T-shirt with the word "hero." Dozens have been detained on suspicion of terror propaganda for wearing similar shirts. More than 50,000 people have been arrested since the bloody overthrow attempt. Getting very nasty - I assume belts, etc, will be taken away to further lower the dignity of the accused, in traditional kangaroo court fashion? Swedish writer wanted by Turkey arrested in Spain. Yalcin is said to have been stopped in a passport control on Thursday when leaving Barcelona to travel to London. He was arrested in response to an Interpol warrant issued by Turkey, said his partner. "Spanish courts have told him that Turkey is accusing him of having organized terrorist acts at the newspaper Odak Dergisi in Turkey in 2010," his partner told Swedish newswire TT. Yalcin, who lives in south-western Sweden and is a dual citizen of Sweden and Turkey, has worked as teacher and editor-in-chief of socialist magazine Odak Dergisi, and has been involved in Amnesty and Författarförbundet, a Swedish organization for authors. "There is a serious risk that he will be extradited to Turkey," a newly-launched group backing Yalcin wrote in an e-mail sent to The Local and other Swedish media. "It is of utmost importance that Swedish authorities move quickly to ensure Hamza Yalcin's legal protection." Yalcin is the second Swedish national to be arrested on Turkey's orders in less than a month. Sweden's foreign minister criticized Turkey last month after IT consultant Ali Gharavi was jailed in the country along with several human rights activists for allegedly aiding a terror group. The Swedish government said at the time that he is understood to have been there to attend a seminar about freedom of the internet. The Swedish branch of writers' assocation PEN International also called on Sweden to act. "It is obvious that Turkey and President Erdogan show a complete lack of respect for the EU's citizens. Sweden must of course do everything to ensure the release of these two and it is urgent. Sweden has to act now and make the EU react," PEN Sweden's chairwoman Elisabeth Åsbrink told TT. Sweden's foreign ministry confirmed on Monday that a Swedish national was being held. "Our embassy is monitoring this case," a foreign ministry spokesman told TT. Hmm, don't like the sound of that, something dirty's afoot, IMO. Turkey: Russian national detained over planned drone attack. ISTANBUL (AP) — Turkish authorities have detained a Russian national and suspected Islamic State group militant for allegedly planning a drone attack on U.S. aircraft at Turkey's Incirlik air base, police said Thursday. Renad Bakiev was detained in the southern city of Adana over suspicions that he plotted to crash an American aircraft or attack the Incirlik air base using a drone, Adana police said in a statement. Turkish private news agency Dogan said a court later ordered him formally arrested pending a trial. Bakiev also intended to attack the local Alevi community in Adana city, the statement said. It said he was affiliated with IS and had previously traveled to Syria. The Alevi religious minority is an offshoot of Shia Islam and is the largest religious group in Turkey after Sunnis. IS regards Alevis as heretics. Bakiev appealed for 2,800 Turkish Lira (nearly $800) from other militants on the Telegram messaging application, which IS sympathizers use widely, to buy a drone, police said. The private Dogan news agency said during his questioning that he allegedly defended the need to kill Alevis and considered them "enemies of Allah," the statement said. During police interrogations, Bakiev admitted to reconnoitering the air base for his strike, the police statement said. A previous attempt he made to attack Americans was unsuccessful. Bakiev's plans came to light in testimony from suspected IS members detained in a counterterror raid in June, according to Dogan news agency. That operation captured the alleged commander of an Adana-based IS cell, 32-year old Abdulkerim Cakar, and 10 others. The U.S. Air Force has used Incirlik air base, near Adana, as a staging post for the air campaign against IS in Syria and Iraq since 2015. IS militants have used armed drones to deadly effect in Iraq and Syria, converting commercial drones to carry small explosives. IS regards Alevis as heretics. These damned Sunni extremists are a blight on the whole of humanity. I know there is a great wrong with, say, Iran, but Shia islam seems to be light years ahead of these Dark Ages throwbacks. Turkish political refugees flock to Germany, seeking safety. BERLIN (AP) — The Turkish judge sits in a busy cafe in a big German city. Thirteen months ago, he was a respected public servant in his homeland. Now he is heartbroken and angry over the nightmarish turn of events that brought him here. The day after a 2016 coup attempt shook Turkey, he was blacklisted along with thousands of other judges and prosecutors. The judge smiles, sadly, as he recounts hiding at a friend's home, hugging his crying son goodbye and paying smugglers to get him to safety. "I'm very sad I had to leave my country," he said, asking for his name and location to be withheld out of fear that President Recep Tayyip Erdogan's government might track him down. "But at least I'm safe and out of Erdogan's reach. He cannot hurt me anymore." Germany has become the top destination for political refugees from Turkey since the failed July 15, 2016 coup. Some 5,742 Turkish citizens applied for asylum here last year, more than three times as many as the year before, according to the Interior Ministry. Another 3,000 Turks have requested protection in Germany this year. The figures include people fleeing a long-simmering conflict in the Kurdish region of southeastern Turkey, but the vast majority belong to a new class of political refugees: diplomats, civil servants, military members, academics, artists, journalists and anti-Erdogan activists accused of supporting the coup. With many of them university-educated and part of the former elite, "their escape has already turned into a brain-drain for Turkey," said Caner Aver, a researcher at the Center for Turkish Studies and Integration Research in Essen. Germany is a popular destination because it's already home to about 3.5 million people with Turkish roots and has been more welcoming of the new diaspora than other Western nations, Aver said. "Some of the highly qualified people also try getting to the U.S. and Canada because most speak English, not German. But it's just much harder to get there," Aver said. "Britain has always been popular, but less so now because of Brexit." Comparable figures for post-coup asylum requests from Turks were not available for other countries. More than 50,000 people have been arrested in Turkey and 110,000 dismissed from their jobs for alleged links to political organizations the government has categorized as terror groups or to U.S.-based cleric Fethullah Gulen. Ankara blames the Muslim cleric, a former Erdogan ally, for the coup attempt. Gulen denies the claim. The true number of recent Turkish arrivals to Germany exceeds official asylum requests. Many fleeing academics, artists and journalists came on scholarships from German universities or political foundations. Some got in via relatives. Others entered with visas obtained before the failed coup. The judge, a slim man in his 30s with glasses, arrived illegally by paying thousands of euros to cross from Turkey to Greece on a rubber dinghy and then continuing on to Germany. Two other Turks in Germany — an artist who asked for anonymity, fearing repercussions for her family back home, and a journalist sentenced to prison in absentia — also spoke of ostracism and flight. Ismail Eskin, the journalist, left Turkey just before he was sentenced to 3½ years in prison on terrorism-related charges. The 29-year-old worked for the Ozgur Gundem newspaper and the Kurdish news agency Dicle Haber Ajansi until the government shut them down shortly after the failed coup. Eskin tried to write for different online news sites but the Turkish government blocked them too. He reluctantly decided to leave when the situation became unbearably difficult for journalists — about 160 are now in jail. "I kept changing places to avoid being arrested, and I hid that I was a journalist," Eskin said, chain-smoking at a Kurdish immigrants' center. He hasn't applied for asylum but is studying German — an acknowledgment he might be here to stay. The judge said he "never supported any kind of coup" and had no connection to the Gulen movement but took hurriedly packed a few belongings and went to a friend's place after learning he was among more than 2,000 judges and prosecutors being investigated. A few hours later, police searched his apartment and took his computer. His wife and children had been out of town during the coup attempt. While he was in hiding, his wife was told she had 15 days to move out. Friends and relatives stopped talking to her. After several months, he chose to leave. "Since there's no independent justice in Turkey anymore, I would have been exposed to injustice, maybe be tortured, if I had surrendered," he said. He sold his car and paid 8,500 euros ($9,910) to a smuggler for a December boat trip to a Greek island. From there, he flew to Italy and on to Germany. He brought his wife, son and daughter to join him a few weeks later. The number of Turkish citizens fleeing to Germany has complicated the already tense relations between Ankara and Berlin. Accusing Germany of harboring terrorists, Turkey has demanded the extradition of escaped Turkish military officers and diplomats. At least 221 diplomats, 280 civil servants and their families have applied for asylum, Germany says. Along with refusing to comply with the extradition requests, Germany has lowered the bar for Turkish asylum-seekers — those given permission to remain increased from 8 percent of applicants last year to more than 23 percent in the first half of 2017. Some Turkish emigres have started building new lives in exile. The artist from Istanbul lost her university job in graphic design before the 2016 coup because she was one of more than 1,000 academics who triggered Erdogan's ire by signing a "declaration for peace" in Turkey. She went to Berlin on a university scholarship in September, not long after the attempted coup. In February, she discovered she'd been named a terror group supporter and her Turkish passport was invalidated. "Now I'm forced into exile, but that's better than to be inside the country," the woman in her early 30s said. The artist said she's doing fine in Berlin. She enrolled at a university and has had her work exhibited at a small gallery. Yet with her family still in Turkey, some days the enormity of the change weighs on her. "In the winter I was so homesick," she said. "I really felt like a foreigner, in my veins and in my bones." I don't blame them for fleeing Turkey. They are very obviously in great danger, and are geniune asylum seekers, not just chancers looking for free stuff.